While winter may be cold and wet, that doesn’t mean a firefighters job is done. On late Sunday night, Fire District 1 responded to a house fire on Old Springdale Road after neighbors saw the blaze and called 911. Fire District 4 also responded as mutual aid on the call. The house was unoccupied and the cause of the fire is under investigation. Shortly after finishing their assist with the house fire, Fire District 4 units were called to Waitts Lake Road just outside of Valley after a logging truck clipped a low-hanging power line over the roadway. No injuries were reported and Avista responded to shut off the power. Stevens County Fire District No. 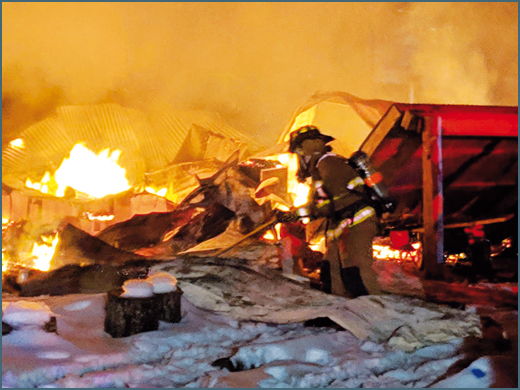 1 responded to over 1,500 calls in 2018 Stevens County Fire District No. 1 which covers the growing southern part of the county, responded to 1,509 calls in 2018, breaking the district’s previous record of 1,440 calls in 2015. Since 2011, there has been a 32 percent increase in calls. Fire District 1 calls in 2018 were 68 percent for EMS/Rescue related while nine percent was fire related. The other 23 percent were miscellaneous service calls or DNR/State mobilization requests. Bucy said that when people see smoke, they are calling it in earlier than they did prior to 2014. Fire District No. 1 is staffed by eight career firefighters and approximately 50 volunteers. “With the record call volume in 2018, our career and volunteer staff are working even harder,” Bucy said.